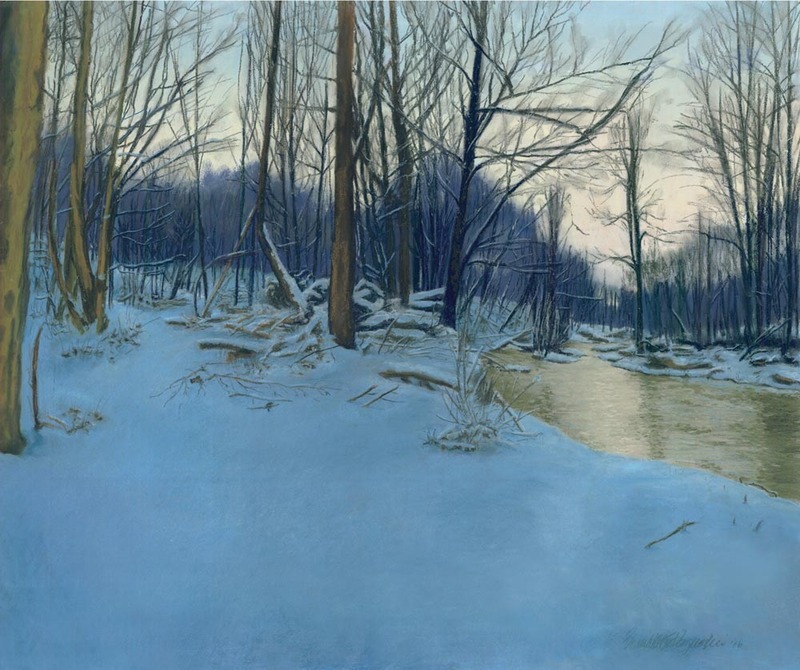 A fitting way to send off the year, with a painting of the “blue hour”, “l‘heure bleue“, that time of transition, and though it really is a painting of the woods in snow this painting is still connected to my felines in a very deep and special way, and to many other things. That “blue time of day”…a quick walk in the woods after a heavy snowfall as the sun set on the distant horizon, bare trees like sentinels. This time of day always carries a certain melancholy for me, as if a deep instinctive part of me realizes the sun is about to leave and may not come back, just as our ancestors did. The moment stands in all its quiet beauty along Robinson Run in Collier Township, on a trail running parallel to the Panhandle Trail, where I visit frequently for photos, art, writing and meditation. Every once in a while I do a painting that comes straight from the heart, and there is, of course, a feline connection with this painting as well. I wandered onto this scene one Sunday evening after a visit to my mother, who lived in a personal care home not far from the trail. Visiting my mother and visiting the trail were intertwined for a decade, and Sunday visits were often a day on the trail with a late lunch to visit and rest when done, or a visit followed by a meditative evening walk. On this day I left my visit after a quick, heavy snowfall had evenly blanketed everything, but the squall and the clouds cleared just before sunset. Instead of heading home I was drawn to the idea of a walk in the quiet after the snow. I left the main trail to wander a familiar path through the silent trees while the stream babbled along at my side. Detail of stream and snow. I came to this familiar clearing with its perfect expanse of unbroken fresh snow just as the sun was disappearing behind the fringe of trees, on its way below the horizon, and I stopped. At this time, just before twilight, the last of the sun is casting direct light, but it’s also reflecting off the atmosphere creating that wonderful rich intensifying shade of blue. You can see, at the lowest point of the trees above the stream, the slight bright spot which is the sun about to set. With snow, the blue of the sky is perfectly reflected, and the snow itself is bluish, and the slight misty haze among the trees from the humidity of the snowfall casts a bluish haze as well, but you can still see the gentle highlights on every branch, every rise in the snow. But the beauty wasn’t just in the woods and trees, but in the sky above as well, that wonderful tangle of branches overhead. I studied the different branches on the sycamores and maples, how much more detail I could see the farther up I looked, each branch and twig with its own little blanket of snow. Detail of sky and branches. I had only my tiny original 2MP digital camera with me, not intending to spend creative time there, and knew there was no way such a small thing that didn’t even have a zoom could catch the details of this scene, but I snapped a few photos anyway. The scene only lasted two or three minutes before the sun was completely gone and the blue snow lost its luster. I set an intention to come back to do a painting, difficult as that would be at this time of day when the light changes so quickly, but I could set up the painting and get everything in place, and be ready to catch that special light. But by noon the next day the snow had melted significantly. I waited for similar conditions through the next month and the next winter with no significant snowfall around the right time, about 5:00 p.m. in late January, or early December as the time of day, angle of the sun and quality of light would be about the same before and after the solstice. By early February in 2006 I couldn’t wait any longer. The scene and the painting I visualized haunted my thoughts. It had to be painted, and I decided I’d have to do my best with my photos. I began with my main reference photo and a few detail shots I’d taken of the stream and tree trunks and pieced them all together. Reference photo for Dusk in the Woods. You can see the difference between the reference photo and the finished work. 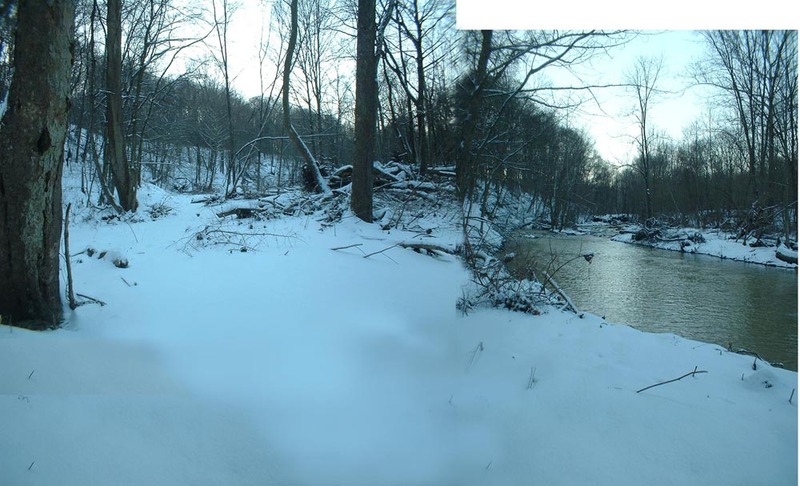 I wanted to catch the spread of land between the stream and the bank on the right side all the way up to the slope rising on the left but still have a section of sky at the top and that wonderful unbroken snow at the bottom. I knew I wanted a fairly large painting, but wanted to keep it within the limits of standard mat and glass sizes for framing. I had no pastel drawing paper the size I needed so I prepared a piece of illustration board with several layers of pastel ground, sanding in between, and planned out the scene. 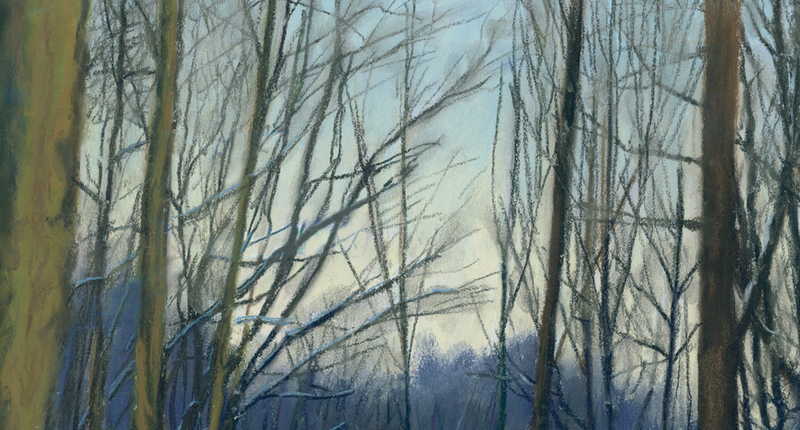 I removed a section in the middle of the scene and its trees and debris in the snow, leaving enough to get the feel of the denseness of detail. I wanted the feeling of the scene, not every last detail. And I made those decisions using my own memories of scenes like this and the full force of the emotions I was experiencing at the time. 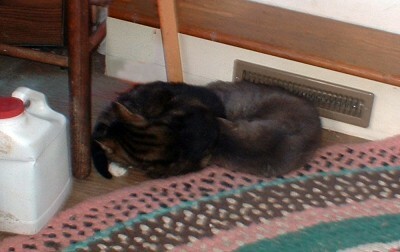 Stanley and Moses curled together at my easel. 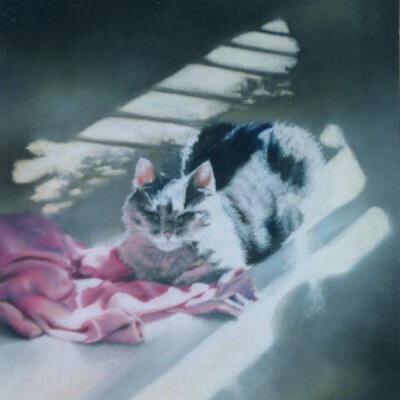 My precious Moses was nearing her end as I worked on this, me all through the night at my easel, her at my feet, every day losing a little more physical control as, at 19, her body just began giving out. My art helps carry me through difficult times as well as good times as I can lose myself in creating the painting and the scene itself, let go of everyday life for a bit to let the magic work itself without the assistance of my logical decisions, and returning with new observations. I needed a project as big as this to bear the process of Moses’s loss, and to maintain my strength and calm as I walked the last part of the journey with her. I painted the basics of the painting using my photos, getting everything into proportion and perspective, working out my palette. 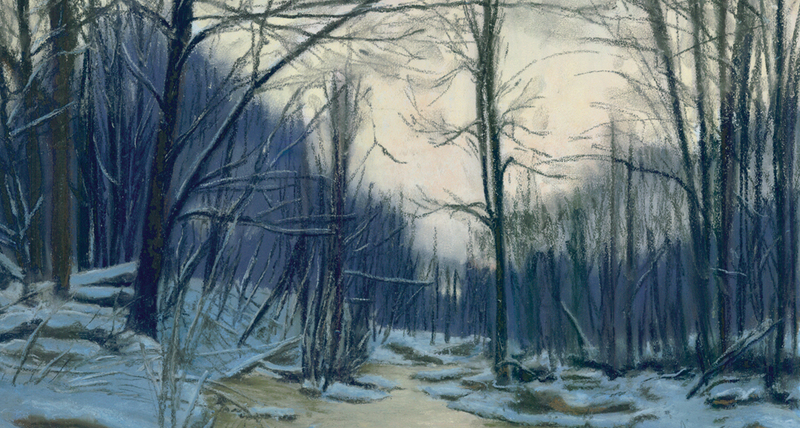 I had developed my own technique with pastels to maintain brilliant colors like the snow when necessary and to enhance deep rich colors like all the trees to maintain their dimension; I use these same techniques in all my pastel paintings to a certain extent, and most definitely in my pastel portraits. Pastel is not entirely opaque, your eye can actually perceive layers of color and works the colors together, so I choose a complement to the apparent top color, sometimes more than one color complement. For instance, underneath all that blue snow is a layer of pale yellow, the brown and tan trees are purple. Then I put away the photos and work from my heart as I do with all my larger paintings, portraits included. I remembered not only that day in the woods by many days all through my life in the woods. I pictured the sycamores with their mottled bark, the maples with their fringed upper branches, the soft drifting of snow as it covered all evenly. I listened in memory for the babble of the stream, and actually needed three tries before I heard it in my painting as well as in memory. And the arc of the sky over the valley, the shading from the pink and yellow of sunset to the darkening blue of dusk in the sky, most of all, I waited to feel the calming quiet of the woods, not silent because of all that lives there, but a hush. Nature knows how to rest. It may not come across here, but at a larger or full size most people sense a feeling of transition and light despite the dusk, and I credit being able to capture and convey that sense to Moses and that time between us. And though I had taken the reference photo nearly exactly a year before, on January 30, 2005, I also realized this was one of the places I had been the afternoon on January 31, 2006, just a few weeks before I began this painting, when I ran through those same woods during the January thaw watching the return of life knowing the cold would soon return and wrote “Things I Found in the Woods” about Moses, and actually one of the places I stopped to write down the first notes for what would become the poem. It’s all in the painting. I will always connect this painting with Moses, and those late nights when I disappeared into this scene in order to paint it from memory, and when she awoke and looked up at me with a deep and soulful expression I knew we were sharing the same figurative path. I felt very tied to this painting on so many levels. Initially it was not for sale, then I priced it way above what I knew it would ever sell for to make sure either no one would want to buy it, or the purchaser was truly serious about it. The couple who did purchase it had been the ones who worked very hard to conserve this very spot of land, live above it at the top of the hill and are friends of mine—I told them the price they saw was a “fake price” and we were all very happy. “Dusk in the Woods” was the signature painting at my first annual poetry reading and fine art show at Andrew Carnegie Free Library & Music Hall, Paths I Have Walked. The theme was, literally, the paths I’ve walked all over this valley since childhood, and the inspiration they’ve given me and because much of my poetry is about literal and metaphorical paths, it is also the title of my first self-published poetry anthology. I sell this image as a 5″ x 7″ greeting card, and I also have a range of prints on paper and canvas, including digital prints from 8″ x 10″ to 11″ x 17″, and highest quality giclee prints up to the full size of the painting, 31″ x 24″ that are so well-done that even I have to look a little more closely to tell it’s not the original. I offer canvas prints from 16 x 12 to 32 x 24 that can be hung as is or framed like an oil painting. Please visit this post in my Etsy shop for all the possibilities. And occasionally I have the image imprinted or used in another product such as a woven cotton throw or a keepsake, so you can search my shop for “Dusk in the Woods” to see if any other products are available. Deb Chebatoris of Chartiers Custom Pet Cremation purchased a framed print of “Dusk in the Woods” to hang in the room where we say goodbye to our precious animal companions, feeling it conveys that sense of transition, that darkest day of the year which, in time, will see the return of the light and the coming of new life as we heal from the grief of our loss. I have personally appreciated studying it more than a half dozen times as I say goodbye to one of my cats. Each reproduction goes off with a bit of Moses and me. Click here to visit Fine Art and Portraiture on my main website. Also visit my Etsy shop to see what’s available in my Landscapes and Still Lifes Gallery. This entry was posted on December 31, 2014 by Bernadette. It was filed under art, original art, pastel painting, snow, trees, winter, woods and was tagged with bare trees, dusk in the woods, moses, pastel painting, pastel painting of snowy woods, snowy woods, winter artwork.